Do you see the text that says "Download this GeoTour" near the top right of the page? Try that. It's essentially a "pocket query" that both Basic and Premium members can access. You can download all the caches in this GeoTour and save it directly to your GPS device. Most newer devices allow you to copy the file directly to the internal memory of your GPS device using a cable provided by the manufacturer. Yeah--I saw that. Downloaded, tries to open in BaseCamp and says "utah-geotour (1).gpx" could not be imported." And I'm not about to do them one at a time. Haven't tried it with the GPS attached. And do you have Garmin's BaseCamp software on your machine? No other software I have gets even as far as one cache. visit-utah-geotour GPS exchange file 1,423 KB - which looks right. Once I open the file in GSAK, it disappears from my machine, behaviour I've never seen before. In the intermim, this bookmark list can be PQ'ed. It may be slightly outdated..
Edited to add that I've now downloaded from the GeoTour page several times, fooling with it. On the third or fourth (? unsure) download, I tried opening in Expert GPS again, which worked sort of. Previous effort had failed to even open. I'll see to it that the bookmark list is up to date today. That's your best work around in my opinion. You can make your own bookmark list pretty easily as well. From the search page, click on filters. In the "geocache name contains" put in keywords "utah geotour". Click on the select all box. Then you can add them to an existing list or make a new one. After you make your list be sure to go to list management and deselect notifications for the list or your email will be bombarded with all the finds that are logged!! 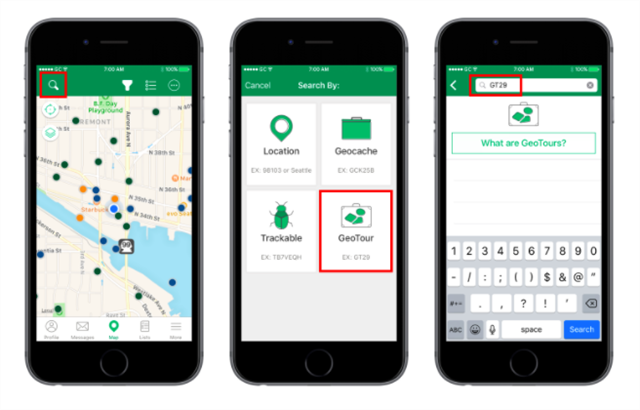 Another option is to use the new free geocaching app on your smartphone. The Utah GeoTour code is GT54. Thanks, railroader921. Here's more info on that. Hm. I'll ask someone smarter than me to look into this. Bingo! On the smartphone app. That allows you to create a list and then a PQ from there! Thanks, railroader921--great advice! Could not get the filter approach to work, though. I just did a little experiment. I just downloaded the geotour file from the "Download this GeoTour" link. I had had also downloaded it before a trip to Utah this past September. I tried importing today's file into BaseCamp - got an error message and the file could not be loaded. I then imported the file I downloaded on 9/8/2016 - that file loaded fine and I could see all the caches. The file sizes are similar, today's file = 1,383 kb, file from 9/8/2016 = 1,368 kb. The small difference could be from differences in recent logs. I wonder if there is log entry that has corrupted the .gpx file? I've heard that can happen, where a single log entry with weird characters can corrupt an entire .gpx file. Of course, it would be a log entered since 9/8/2016. I'm happy that worked for you. That said, maybe there's an easier way. Just use the app like this and input GT54 when asked for a GT code. Thank you! A smart Lackey here has also been taking a look.